Distinctively designed with a classic sense of style, Jamala Madikwe boasts an elegant flair equal to the savage beauty that lies beyond. 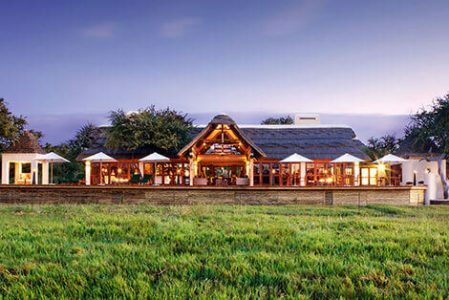 Set in the pristine 75,000 hectare Madikwe Game Reserve, the lodge’s wildlife and game-viewing opportunities are matched by their culinary offerings: led by chef Nico Verster, Jamala Madikwe’s cuisine has twice garnered the Safari Award for best cuisine. “Jamala” is the Swahili word for “natural elegance” – and when you see it, you’ll understand why. Those looking for an ideal safari experience that combines luxury and comfort with the reserve’s rugged, natural beauty. Favourite experience? Sipping sundowners on the patio while elephants drank from the watering hole just a few yards away. Everything about Jamala Madikwe – the cuisine, the design, the incredible setting – evokes luxury and elegance. This isn't just a safari – it's an elevated and elegant experience. The closest airport to Jamala Madikwe is Sir Seretse Khama International Airport in Gaborone, Botswana (GBE), about a two-hour drive from the lodge. Other options include Johannesburg’s O.R. Tambo International Airport (JNB) and Lanseria International Airport (HLA), both about a 4.5-hour drive away. Well positioned within the reserve’s treasure trove of animals, Jamala Madikwe incredible safari experiences including sighting of the big 5 and super 7. Madikwe Game Reserve is one of the best conservation areas in all of Africa; at Jamala Madikwe you will get to experience this diverse and rich ecosystem with over 130 mammal species and 300 bird species, not to mention the vast landscapes of plant life. Jamala Madikwe gently embraces the lay of the land with five freestanding luxurious villas. 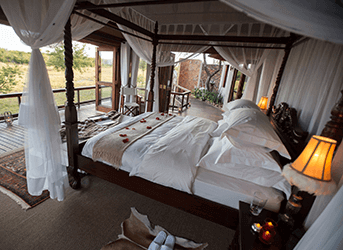 The Jamala Madikwe villas exude colonial charm perfectly suited to a luxury safari experience. Each slice of paradise is fully air-conditioned and offers superlative luxury and intimate privacy combined with extravagant outdoor facilities which include individual rim-flow pools and salas, expansive wooden decks and private outdoor showers. The wildly luxurious Chinzombo Camp perfectly blends modern architecture with tranquil surroundings to create an exquisite bush camp experience. Looking to extend your adventure? Discover a few other incredible journeys through some of South Africa’s most picturesque playgrounds.